In 1965, a philosophy professor at Peru’s University of Huamanga named Abimael Guzman — also known as “Chairman Gonzalo” — travelled to China with seven other Peruvian communists; he would return to become the most famous Maoist in Latin American guerrilla history. While in Beijing, Guzman got to see Chairman Mao, but only from afar. Guzman was also greatly inspired by a rally in Tiananmen Square where the masses waved red flags, sang “The East is Red” and “The International,” and chanted “we support Vietnam” and “down with Yankee imperialism.” Guzman was impressed by Chinese factories, schools, universities, hospitals, communes – all teeming with optimistic energy as the socialist society was being constructed. He then attended classes on revolution, politics, and party organisation. And in Nanjing, he received military training, including how to make explosives out of anything. He recounts in his autobiography, Memories from Nemesis (Memorias desde Némesis) 2014, that even the pens they used in class blew up; the teachers used this example to convince the class that anything was possible when you had the support of the masses. Guzman, leaning heavily on Mao, developed his own theories on revolution and communism – “Gonzalo Thought” — and took charge of the Peruvian communist movement. 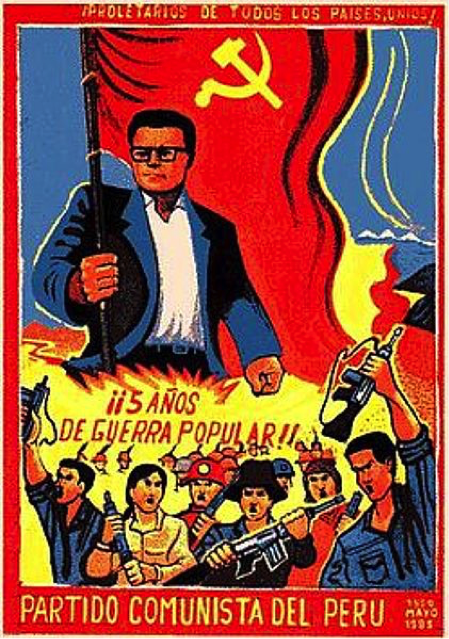 The Communist Party of Peru, commonly known as Shining Path, formed in 1970 as a splinter group of the Maoist group Red Flag. 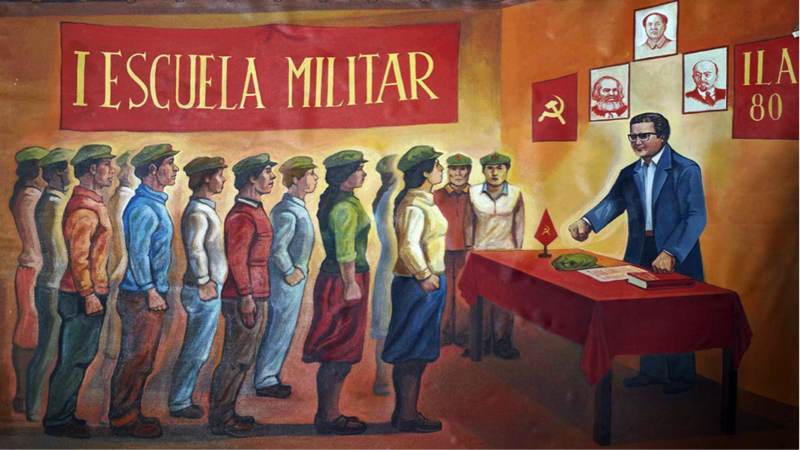 In 1980, Shining Path, under Guzman’s leadership, decided to boycott the first Peruvian elections in twelve years – and to instead take up armed struggle. According to Guzman, Mao’s idea of a peasant revolution leading to a dictatorship of the proletariat was the way ahead for Peru, which, like China, had a large rural population living in poverty. To complete Peru’s proletarian revolution, Guzman said, a million people would have to die in a people’s war in which the state had to simultaneously be destroyed and rebuilt. Imperialism and bureaucratic capitalism were its targets. Shining Path took this to an extreme – even killing flocks of sheep bred in New Zealand – as they represented capitalist imperialism. Guzman found numerous willing soldiers among Peru’s indigenous Amerindians. Making up around half the country’s population, they lived largely in rural areas and had been exploited since the 16th century when the conquistador Pizarro destroyed the Inca Empire. The modern Peruvian government had done little to develop agriculture and infrastructure; wealth and power remained concentrated among the Spanish-descended elite in the coastal cities and they largely ignored the interior. Those living in the mountains and jungles, disaffected by a system that Guzman defined as semi-colonial, were ripe for recruitment to his revolutionary cause. Guzman was a slavish imitator of Mao. Guzman, a Mestizo, studied Quechua and idealized the Incan civilization, especially its system of collective agriculture. 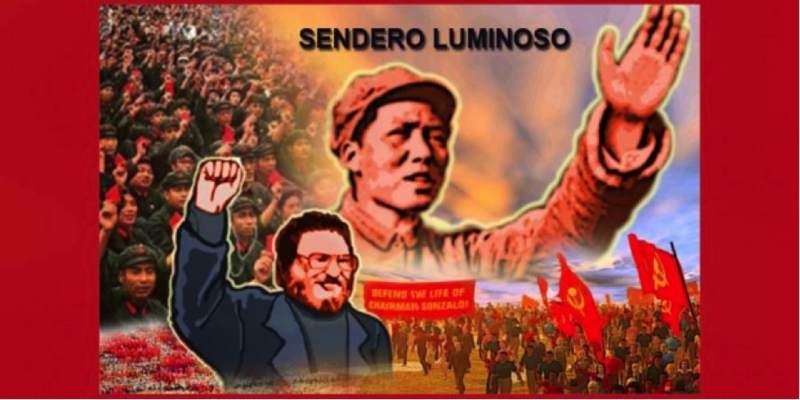 Under his leadership, Shining Path’s first phase of action began in 1980 with sabotage, land redistribution, and political propaganda. Their posters were often coloured black, symbolizing the rottenness of the current state, and red, symbolizing the promise of a new age. The red sun, sometimes used as a backdrop for a book toting Presidente Gonzalo, was an Incan symbol of power — as well as another name for Mao. This kind of visual imagery was important for those not likely to read Guzman’s tracts of communist theory. Quechua and Aymara speakers had a high rate of illiteracy in Spanish, which disenfranchised them – Spanish literacy was a requirement to vote. The leadership group of Shining Path largely came from the university scene of Ayacucho, where Guzman taught. His students then set about recruiting in rural areas where they came from. Guzman’s critique of capitalist imperialism also aligned with the powerful local myth of the pishtaco. A pishtaco was a kind of vampire appearing in a village as a gringo or travelling businessman who somehow sucked the fat out of his victims and used it to make soap or grease machines. The government of Peru, which Shining Path saw as evil and pishtaco-like, started to come under pressure once Guzman initiated the guerrilla warfare part of his plan in 1981. Terrorist attacks on government offices, banks, hotels, and police stations were stepped up; buildings were dynamited and firebombed. The police forces in Shining Path strongholds of Ayacucho and Huancavelica were largely defeated. Shining Path also became popular in the shanty towns surrounding Lima as they had started up social programs there. Guzman was a fan of Mao’s tactic of strangling the cities from the countryside, but he also realised urban recruits were essential in winning the people’s war. When Alberto Fujimori became president in 1990, the fight against Chairman Gonzalo’s guerrillas intensified. The military formed a government-backed death squad named Grupo Colina. The group used the so-called Doctrine of National Security, which had been formulated in the United States due to cold war thinking. The doctrine, although never official, outlined an anti-subversive strategy for taking on communist revolutionary guerrillas; the government would implement the very same terror tactics the guerrillas used with no regard for human rights – ojo por ojo, an eye for an eye. So the government armed peasants with twelve-gauge shotguns and organised them into groups called rondas (which Fujimori legalised) to fight against Shining Path. Added to this scene were the MRTA guerrillas, not as bloody as Shining Path – but also the perpetrators of violent acts. The result of all this was 70,000 deaths from 1980 to 2000. Nearly half of all these deaths have been attributed to Shining Path; a third to government forces; the rest to other terror groups, village militia, narcotraficantes, etc. Captured Shining Path guerrillas started to fill up prisons where they took over and organised themselves as a collective with tight discipline. They marched in Chinese-style military uniforms, waved red flags, and chanted Marxist slogans. The government eventually stormed the Castro Castro prison in Lima to regain control and executed a number of the inmates. Shining Path replied to this with a spate of car bombings around Lima. By 1992, however, Shining Path had basically lost the war. Guzman himself was captured after a long surveillance program of Shining Path operatives led to a house in an upper-class neighbourhood of Lima, a place nobody suspected Guzman to be. The house was producing far too much rubbish for the couple who were seemingly the only occupants. In the rubbish, police found used tubes of medicine for a skin disease Guzman was known to have as well as packets of the cigarettes he smoked. On the strength of these indicators members of GEIN (Grupo Especial de Inteligencia del Perú) stormed the house and found Guzman in an upstairs room sitting at a desk. He has been sitting in “Nemesis,” the nickname of the naval base prison on the island of San Lorenzo off the coast of the Peruvian city of Callao, ever since. 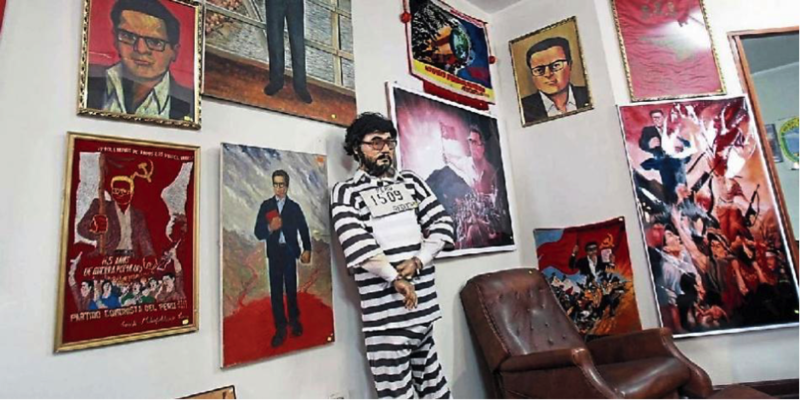 A small museum at the anti-terrorism police headquarters in Lima now houses an exhibit of artworks seized from Shining Path prisoners. These include paintings, carvings, and propaganda posters. Among the paintings, there are a few commemorating violent acts committed by Shining Path such as ambushes of police. Some of the propaganda posters bear the phrase “destroy to construct” (destruir para construir), which is obviously taken from Mao’s Cultural Revolution slogan “destroy the four olds and cultivate the four news” (破四旧立四新). The 1200 objects displayed are by and large gifts given to Abimael Guzman. The exhibition is not open to the general public but to government and educational institutions with prior permission only, indicating how raw the history of Chairman Gonzalo’s clandestine war remains in Peru. Frank Beyer has a degree in history from the University of Auckland. His work has appeared in the LA Review of Books, Asian Review of Books, and Headland Journal.